I rate Devil Sharks a solid 3 stars—nothing more and nothing less. Though I didn’t really think it was as good as Chris Jameson’s previous shark thriller Shark Island, if you’re looking for the book equivalent of a cheesy creature feature or the type of B-movie horror flick you’d catch on Syfy, then this will do the trick nicely. When Alex Simmons was in college, he and his group of friends were as thick as thieves—or they were, until one of them took their own life. After the suicide, nothing was the same again, and a bitter rift also formed between Alex and Harry Curtis, the most complicated of them all. Now, a decade later, Harry appears to want to make amends. A financier who has done very well for himself since graduation, out of the blue he invites Alex and the rest of the gang to an all-expenses paid trip to Hawaii where Harry owns a vacation property as well a hundred-foot luxury sailing yacht called the Kid Galahad. An innocent college reunion, the invitation claims, where old friends can come together again and spend a week in paradise. Despite his doubts that Harry has changed, Alex reluctantly accepts, and soon he and his wife Sami are jetting off to Honolulu to meet up with the others. The next day, all ten of them—including the six surviving members of the original college crew, a few of their spouses, and the first mate of the Kid Galahad—set sail for a perfect day on the water. Then, Harry surprises them with even more news. In the middle of the ocean hundreds of miles from anything is a small island called Orchid Atoll, the site of an old defunct Coast Guard station where Harry’s dad used to be stationed. Harry wants to make a personal pilgrimage there to pay his respects, and the others, touched by his story, agree to go along. Once there, however, the group discover that the station is not as abandoned as they thought. Shell casings and maps of illicit trading routes point to the presence of drug smugglers, and soon, paradise turns to hell as Alex and his friends become trapped in a nightmare full of man-eating sharks and pirates. 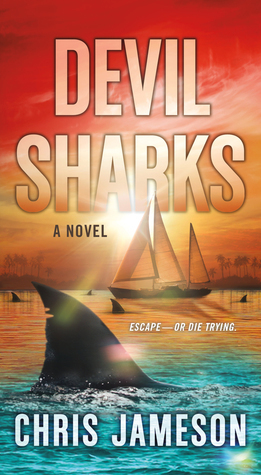 Like I said, Devil Sharks was an overall solid and fun read, though I do have a few quibbles. For one thing, I did not think that the story was as well put-together as Shark Island. I always hate to make comparisons to an author’s previous works, but in this case it’s a little hard not to, since both are ocean-bound thrillers dealing with the theme of killer sharks. Whereas the plot of Shark Island followed a logical progression of events, Devil Sharks seemed to lack a sort of cohesion, with multiple story threads that seem to hit dead ends or trail off with no resolution. There’s also not enough detail explaining the rivalry between Alex and Harry, or enough focus the latter’s ultimate reasons for inviting them all out to Hawaii especially given the way his motives were questioned again and again by the former. There’s also a lot of death, as you’d expect. I don’t really have a problem with this by itself, since horrible and gory demises are par for the course when it comes to books like Devil Sharks. What irked me, however, were the number of stupid deaths. Again and again, the author would build up a character only to kill them off abruptly as soon as he or she was starting to become interesting, seemingly for no other reason than “just because”. It felt like such a waste. Recall what I wrote about Shark Island and why I thought it was such a great read because of how sympathetic the characters were; I actually cared about them before they were all consigned to their watery, shark-infested graves. In contrast, I felt nothing of the sort for the people here, and quite honestly, it was hard to care when any of them died. Most of them were shallowly written, underdeveloped, and unlikeable to boot. Part of this was due to the sheer number of characters, and I feel the story would’ve worked just as well, if not better, with fewer of them to keep track of. But of course, if you’re just in it for the shark action—like I was—you’re probably not going to care too much about any of the novel’s shortcomings. In this context, they truly are minor annoyances that overall shouldn’t take too much away from the bloody, brutal, intensive shark feeding frenzy this book was intended to deliver. At the very least, it succeeded in its goal, and hence I would recommend Devil Sharks (and to a greater extent, Shark Island) if you’re looking for some over-the-top and campy creature horror this summer. Amen to that! Unless a character has a blindspot that has been built up, I can’t stand when an author makes them do stupid things because it is convenient. I’ll be the first to champion the idea that humanity is stupid as a whole, but even with that is the fact that we thrive to survive, hence our almost 8billion population at the moment. Yeah, it was a combination of the characters doing stupid things, and the author just building them up and unceremoniously killing them off. I hate that, it made all the hard-won character development feel like a waste. Totally understand! Though I must say Shark Island was actually pretty good and worth reading. So I guess I should read Shark Island first huh? You know, when I got these, I thought this one was a sequel but quickly learned it wasn’t. It does sound like a fun summer read though as long as you don’t go into it expecting much. Yeah, both books are stand alones and their stories are unrelated, but Shark Island was definitely the better book and the one I would read if you had the choice between the two! Well, this is perfect timing for me. Just started vacation (which means I can read blogs again! ), and this is a book I REALLY wanted to hear how it was! Probably not for me but, in spite of a few issues, you sound like you still had fun. Pity it didn’t quite live up to expectations though having enjoyed the previous book. Hahaha yeah, most people are into these kinds of books for the shark action, but stupid and pointless deaths definitely can ruin the suspense for you. 😂 Excellent review! I sort of had to skim the reviews as I plan on reading it soon! I love the colours on that cover.